I could list a whole bunch of sour grapes, but instead, I say, "Congratulations!" to the Mountaineers for a game very well played. I have never seen a game with so much emotion, so much to prove. 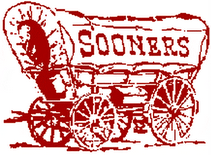 I am sorry that it was the Sooners that they unleashed all this pent-up feelings. At one point, in the fourth quarter, when I realized that we were indeed going to lose, I decided to just watch the game, trying as much as I could to detach myself from my emotions. I was totally amazed at the speed of both their defense and offense. They were amazing. Watching their interim head coach have the excitement of his first bowl win and watching their players become emotional was really something to behold. I think this is one of those bowl games where OU had NOTHING to gain and everything to lose and that is just what we did: we lost everything. West Virginia had nothing to lose and everything to gain. They wanted it more. I hold no grudges; it was a clean and convincing win. Classy way to handle it. As I watched the game, I too noticed WV's speed. I knew they had it on Offense, but their Defense surprised me. It obviously wasn't the same team that lost to Pitt. Granted, Pat White was knocked out of that game, but they looked like a completely different game and I think most of America was basing their expectations on that game and OU's big win over Mizzou (or at least I was). The only point I disagree with you is the nothing to win comment. Like UGA & USC, OU is one of about 5 teams that are already being heralded at contenders next season. A big win here could set up a great preseason rank and help with that run. So far USC & UGA have taken advantage of that while OU & Florida have not. Nonetheless, it was a good season for the Sooners and WV was a tough opponent. BTW, WVU hired their interim coach which seemed like the right thing to do. I think you handled that maturely Rev. Boyne.